Our partners in housing during The RS Tera World Challenge Trophy 2019 (more specific information on each place further down). When you book remember to use the code Tera2019 as many rooms and cabins are prebooked for you sailors! Many of these places have a discounted price until the end of February. – Private cabins – different sizes and standards in Ljungskile or surroundings. Please scroll further down the page for more info about each location. Anfasteröd Gårdsvik is a small holiday destination, nestled between the forest and the ocean, 4 km southwest of Ljungskile. We are a small scale family run business who care for nature and take inspiration from the rich history of the area. We offer a range of accommodation options including cottages by the sea, apartments in historic buildings, modern glamping tents with bathrooms and kitchens, and tent and caravan sites. We are located on the seafront with a jetty for swimming and crab fishing, and a boat ramp for small boats. Boats and kayaks are available for rent, as well as a floating wood-fired sauna. There are many hiking tracks in the surrounding forest, with a world class golf course also within walking distance. Buffet breakfast is served in our fully licensed restaurant, which is open until 6pm Monday to Wednesday, and until late Thursday to Sunday. All accommodation includes breakfast, linen, and cleaning at departure. For more pictures and information, see www.booking.com. Our own website www.anfasterod.se is not yet fully translated to English. info@anfasterod.se or by phone on +46 (0)708 707 270. Until January 2019 we have reserved all our accommodation (approx 55 beds) for the participants of RS Tera World Championship. Would you like to book an accommodation please do so by e-mail to info@anfasterod.se and specify that you are coming for the event. Please note that the event occurs during the peak vacation season in Sweden and it can be difficult to find accommodation. We look forward to seeing you at Anfasteröd Gårdsvik! All houses are recently renovated and have a bathroom with shower, a fully equipped kitchen with a dishwasher if not stated otherwise. 1 bedroom with a double bed and a double sofabed in the combined living room/kitchen. 20 meters from the sea and with a deck. 1 bedroom with a double bed on the ground floor and 2 beds on the loft. 30 meters from the sea and with a small deck. This house originates from 1800 and is located 600 meters from the reception of the resort and 300 meters from the sea, just by the golf club. Ground floor apartment: 2 bedrooms with a 1 double bed and 2 twin beds in total. Garden shared with top floor apartment. Top floor apartment: 1 bedroom with a double bed and a single bed. 1 sofabed in the living room. This apartment has no dishwasher. Garden shared with bottom floor apartment. This house originates from 1800 and is located outside the resort area on a sea meadow 300 meters from the reception. The house has two floors. On the top floor are two bedrooms, one with a double bed and one with two single beds. In the living room at the ground floor is a sofabed for 2 persons. The house I located on its own on, right by the seafront and has a garden. A modern mobile home located on a cliff with a deck facing the sea. Located on the resort and 150 meters from the reception. One bedroom with a double bed and a double sofabed in the living room. Small kitchen with no dishwasher. A modern mobile home from year 2018 located on a cliff with a big deck facing the sea. Located on the resort and 150 meters from the reception. One bedroom with a double bed and one bedroom with two single beds. There is a sofabed in the combines kitchen/living room. Kitchen with no dishwasher. Vacation home from 1940, renovated in 2018. 1 bedroom with double bed, sofabed for two in living room and bunk bed for 2 in an annex in the garden. Bathroom with shower both in main house and annex. Kitchen, terrace and private garden. 100 meters from the reception and the sea. Living area: 30 m2 + annex of 10 m2. Tents with proper floors, bathroom with toilet and shower and fully equipped kitchen. Double bed at ground floor and double bed at loft. Heating system installed and a small terrace. There are two tents. One tent is located in a forest 50 meters from the sea and the other on a cliff 150 meters from the sea. 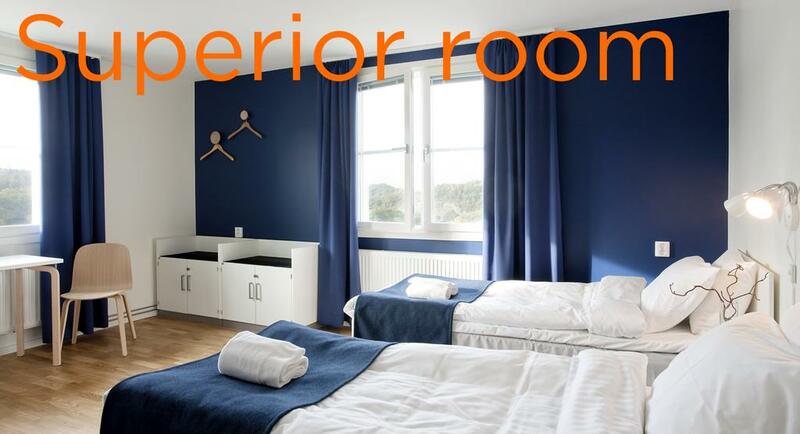 – Accommodation pricing is for two people, with additional people charged at 300 SEK per night. – Children under the age of 12 stay for free. Bookings of five nights or more receive a discount of 20% of the total cost of the stay. – Reservations may be cancelled free of charge until 30 days prior to arrival. – Between 30 days and 48 hours before arrival a cancellation will incur a fee of 30% of the total price of the reservation. – Cancellations later than 48 hours before check-in will be charged the full sum of the reservation. We do not require pre-payment or deposits, except for reservations of caravan and tent sites which must be paid before arrival. NOTE that there is a need of changing rooms during stay unless conditions change for the better and one room full stay. Extrabed in all rooms (in total then for 3 persons) : 300:-/night incl breakfast. NOTE: Limited amount of extra beds. Must be confirmed on final booking. NOTE 2: If the student/hostelrooms are available next summer (cheaper) we will be first in line for them if we want to change! This relaxing conference destination is situated appr 20 min from Ljungskile. Beautiful houses in very well kept surroundings, close to the sea. Breakfast and bedlinen is included in the price. This nice hotel is situated in the nearest town (approx 20 km from Ljungskile) Uddevalla, very close to the famous museum. This is an unforgettable place 20 minutes from Ljungskile, just south of Uddevalla. Gustafsberg was one of the first spa resorts in Sweden, founded late 1700. People came from everywhere to be recovered by seaweed baths and clean spring water. When booking please state name, tel.no and mail address. Please also inform if you want bedlinen and also which house you prefer. Do not forget to print the code Tera 2019! Vandrarhemmet located right near the water, five 4-bed, 3-bed rooms and seven 2-bedded rooms. Most of the rooms, which are former cabanas, opening out onto the water. In all of these rooms are bunk beds. The 3-bed-room there is also a floor standing bed. There are communal showers, one for ladies and one for gentlemen in the corridor, and in the house are also four toilets. Sjöstugan, which is also located on the waterfront right next to the old steamboat jetty, have lower standards. The house has no running water, no shower and toilet refer to the hostel 50 meters walk away. In Sjöstugan are 15 beds in three 3-bed and three 2-bed rooms. Most beds in Sjöstugan are bunk beds. Annexet has five 2-bed room, which is slightly larger and with only floor standing beds. It is located on a hill about 400 meters from the water. The house has two toilets and a communal shower for both women and men. Hotel Tvåan built around 1830, has four double rooms and four single rooms. All beds are floor standing. Bedding, towels and cleaning included. Double rooms have shower and toilet in the room, while in the single rooms are sink and mirror. Shower and toilet for single rooms are in the corridor. Single Rooms in Tvåan facing inward toward the courtyard, while double rooms offer views of the fjord. Hotel Slottet, which was built about the same year as runner-up, has seven double rooms and one simple suite with floor-beds. Cleaning, bed making and towels included. Guestrooms feature sink and mirror. Shared shower and toilet are in the hall. • Guests will stay in our hostels are welcome to bring their own sheets and towels, but can of course also good to rent. • For guests staying at the hotels is the latest check-out time at 11:00 am the day of departure and hostel guests, check-out by 10:00 am the day of departure. • Front desk hours every day is 1/6-31/8 from 9:00 to 11:00 and 4:00 p.m. to 8:00 p.m. For larger groups, we can also be open one or two hours at midday after agree-coming. Guests will have access to the rooms, but the cleaning staff have not had time to go over the whole plant, but it is during the afternoon. • In our hostel accommodation comes STF-off 1/6-31/8, on presentation of membership card. 30 set points for caravans at the price of SEK 200:- plus electricity SEK 50:- per day. Water, toilettes and stations for wastewater are available. For groups, whole houses/baracks with 13 alt 15 double rooms are available, please find more information in the homepage. The houses are well equipped with kitchens and bathrooms. Motorhomes (no handling of wastewater), 200 SEK/day, including electricity, garbagehandling, water and security during night May-September. For booking and more information, please contact Agneta Smith +46 706 820860 or email: agneta.smith@telia.com. Very close! 3 beds, 2 houses, 30 kvm. Price: SEK 4.700/week or SEK 700 per night. Very close.Four beds in each cabin Common shower and wc in the main house basement. Fully equiped kitchen, water by the entrance. Price: 500 SEK per night. Space for trailer and boat available. 5 beds in a cabin just across the bay. With a view over the sailing arena!